Summary on filter effectiveness: It produces 40% cleaner water than municipal water supplies! 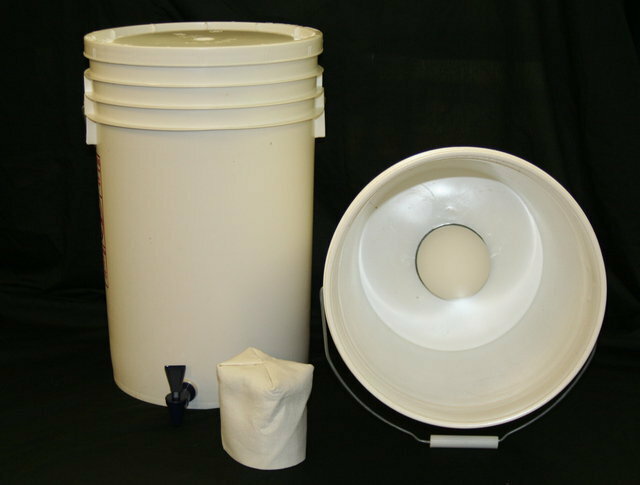 And it costs only $34.50 for the filter or just $61.50 for the entire system…including the buckets!. Add another $79.99 and you can filter out radiation contamination as well!!! I researched/tested/reviewed several systems. I believe in and use the Monolithic Marketplace Ceramic Water Filter. It removes 85 – 90% of all insecticides, herbicides, pesticides. It removes 96 – 99% of metals. It removes 99.999 – 100% of all the ugly virus and bacteria junk. It removes 98% of all particles greater than .2 microns. And its production rate is 14 – 17 gallons per day just by gravity. If you go with the pressure version of the system, you can expect 60gals water production. But at the end of this article I will add a slick little tip to increase the production rate to whatever you need it to be. The filter lasts for 8 – 12 months based on quality of source water, longer if you use a sediment filter, and clean the ceramic filter as directed. But don’t worry, it is only the charcoal in the inside of the ceramic filter that starts to lose its effectiveness. The ceramic filter itself can be cleaned and continues to filter water almost indefinitely. This system is simple, effective, productive, easily maintained, easy to build, easy to transport, and best of all it is priced right! This system can also considered a vehicle transportable system if it not permanently attached to anything. And I strongly recommend that you never permanently attach or anchor a water filtration system; you never know when you might want to, or have to, move it. The heart of the system is the ceramic filters itself. 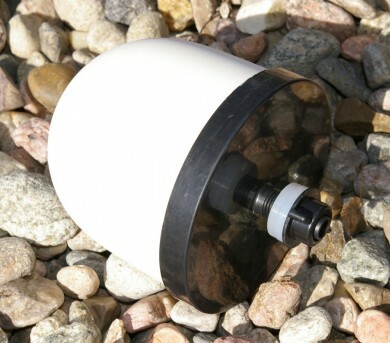 The ceramic .2 micron water filter removes water-borne bacterium. The inside of the filter is loaded with different media or ingredients, such as man-made carbons, Mother Nature carbons and man-made resins. Those different resins and carbons remove the different contaminants in the water. Some Hospitals are using the water directly for IV tubes. This filter system is so effective it even removes Anthrax from the water! The history behind the system is just as interesting as the system is good. Ron Mathis and the Texas Baptist Men’s Water Ministry, the group Ron chairs, are very aware of the importance of potable water. They travel to impoverished or war-torn parts of the world and into places wrecked by natural disasters. Along with some solid engineering folks, Ron and his group developed this highly effective and efficient system that could be used anywhere in the world. If a particular area has a contaminant specific to that area, the contents of the ceramic filter can be modified to meet that need. 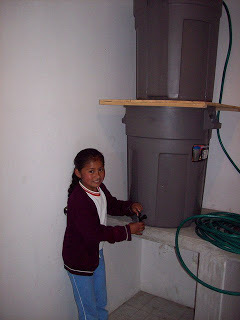 The filter system is currently being used world-wide in disaster stricken areas providing clean, safe drinking water. I have a number of these filters for “grid-down” or any emergency where the water system is jeopardized. But I found a great deal on 6gal buckets vs. the 5gal variety. Use any buckets you want to, just make sure they are food grade. So, you need more water than 5 – 6gals at a time? How about 30gals or more? Just use larger containers. Need more than 14 – 17gals production in a day? Use 30gal containers (or larger) and install as many filters in the container as practical. 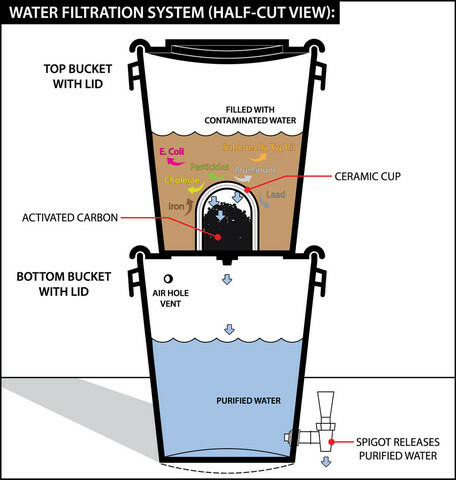 You could easily install 4 ceramic filters in a 30gal container for 56 – 68gals per day production per day. That’s enough daily drinking water for 30 people! 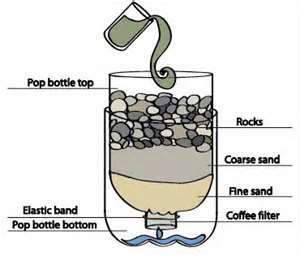 The basic principle is to pass water through materials such as sand, grasses, pebbles, and cloth to remove increasingly smaller particles from the water. Then pass the water over/around charcoal and then filter again (optional). The result is pretty decently cleaned water. Well, far far cleaner than what you started out with. In a container (soda bottle, etc.) cut the bottom off and turn upside down so the smaller neck opening is pointed down. In the bottom directly above the neck opening place coffee filter, cotton balls, waded up material, etc. into the neck of the bottle, place several layers of any kind of cloth material over that forming something like a shallow cup. At least an inch of this material would be good. Place a layer of charcoal on top of that; 1” thick would be nice, 2” if you wish. Then more cotton or other material layered to 1” or so. Then put a couple inches of the finest sand you can find, preferably as clean as you can find. Then layer a couple of inches of courser sand on top of that. Then maybe fine pebbles or small rocks. You can purchase the Monolithic Ceramic Water Filter System at <click here> And the money they make off each filter system goes right back into their charity work!